Today, Suzhou Tourism launches its newest campaign to directly target North American travelers – the “What Type of Suzhou Traveler Are You?” sweepstakes, which is open for entries now through February 29, 2016 at http://www.TraveltoSuzhou.com/Sweepstakes. The lucky travelers (one winner plus one guest) will enjoy a six-day vacation package featuring a personalized itinerary to suit the Adventurous Explorer, Authentic Culture Lover, or Foodie Traveler, determined by the winner’s answers to the interactive online quiz. This promotion is available to residents of the Continental United States and Canada. An increasingly popular destination, Suzhou is situated just west of Shanghai, and is deeply rooted in culture and heritage. It is one of the oldest cities in the Yangtze Basin dating back more than 2,500 years. 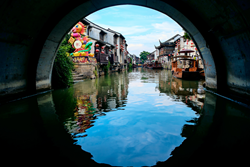 With its narrow streets and winding waterways, Suzhou truly lives up to its nickname as the “Venice of China.” This once-in-a-lifetime trip is inclusive of round-trip coach airfare, accommodations at one of the city’s top hotels, three meals daily, and a guided trip through the city each day. The itinerary will offer quintessential Suzhou experiences based on the winner’s travel personality and feature visits to a selection of UNESCO World Heritage Sites such as the Humble Administrator’s Garden and Lingering Garden, as well as visits to Tiger Hill, the Suzhou Museum, Pinjiang Road, the Silk Museum, Tongli, and authentic experiences at iconic restaurants such as Songhelou and Deyuelou. The trip is the ultimate vacation adventure for anyone who wants to visit China and experience true Chinese culture. Consumers will receive one point for their entry submitted on the sweepstakes website and can share their entry on social media to earn extra points for an improved chance at winning the prize. Sweepstake winners will be announced on http://www.TraveltoSuzhou.com/Sweepstakes on or about March 3, 2016. Travelers can stay connected with Suzhou Tourism throughout the campaign by visiting the destination website, TravelToSuzhou.com, “Liking” the destination’s Facebook page, and “Following” Suzhou on Instagram and Twitter. Suzhou Tourism’s enhanced presence across social media is timed to leverage the momentum surrounding U.S.-China Tourism Year for 2016, ensuring that stories of the city’s unique programming are communicated directly to key audiences, positioning it as a “must-see” destination for travelers who may be considering a trip to China. This sweepstakes builds off an initial social media push for North American travelers, which took place last year and featured Suzhou Tourism’s first-ever sweepstakes, which generated interest from more than 7,000 consumers. Suzhou, the "Venice of China," is known for its elegant stone bridges, canals, flowing water, and noteworthy architecture. Located in the center of the Yangtze River Delta, approximately 60 miles west of Shanghai, Suzhou is one of the oldest cities in the Yangtze Basin dating back more than 2,500 years. The city boasts the beautifully manicured Classical Gardens of Suzhou, nine of which have been designated a UNESCO World Heritage Site. Each year, millions of tourists travel to Suzhou to experience the destination’s more than 400 attractions, ranging from pagodas and temples to historical districts and world-class museums. As the largest industrial city in China, Suzhou is home to Suzhou Industrial Park (SIP), which boasts five-star hotels, the iconic Lake Jinji, and Asia’s largest Ferris Wheel. Travel to Suzhou is easily accessible via three convenient area airports with non-stop flights from North America: Shanghai Hongqiao International Airport (SHA) offers bullet train service to Suzhou, which is approximately a 50-mile, 30-minute trip; Pudong International Airport (PVG) is approximately 65 miles from Suzhou, an hour and half drive; and Sunan Shuofang International Airport (WUX) is approximately 14 miles from Suzhou, a 30-minute drive. For more information on Suzhou please visit http://www.TravelToSuzhou.com, follow us on Instagram @visitsuzhou, Twitter @suzhouvisit and like us on Facebook at Visit Suzhou.